Now, imagine if Fox News had “celebrated” Cinco de Mayo by having a white guy wearing a dime store, straw sombrero and wandering across the screen pretending he’s drunk on tequila. The media wagging tongues would have made it into the worst example of racism since… well, last week’s Sterling incident. But that it happened on MSNBC, no one will likely throw the race card at the extremist, left-wing cable network. Still, that is what happened on MSNBC when network’s morning show, Way too Early, made the switch to its low-rated Morning Joe. As Way too Early was coming to a close on May 5, a show producer named Louis Burgdorf–obviously a white guy–paraded across the screen in front of the host’s station wearing a cheap Mexican sombrero and pretending to be drinking tequila. 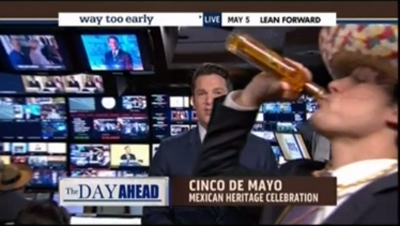 So, a sombrero-wearing white guy pretending at being drunk was the way MSNBC decided to “celebrate” Cinco de Mayo? And no one wants to scream “rraaaaaacism” at that? And can we just dispense that this is a celebration of Mexicn heritage? If you were to ask someone born and raised in Mexico City how he celebrates Cinco de Mayo, he would look at you almost as if you were speaking German. Mexicans do not celebrate any such holiday as Cinco de Mayo. It is an American-created holiday, not a Mexican one. In fact, it had its genesis in our own civil war. It had nothing whatever to do with Mexico. Cinco de Mayo does not celebrate “Mexican Heritage.” It celebrates Mexican-American heritage! Regardless, where are the calls of rraaaaacism against MSNBC? Yep, imagine of Fox had done that.